It’s that time of year again for Boston University Lobster Night. Held annually in the dining halls, Lobster Night welcomes students to campus and a new school year, with a festive New England-themed dinner. This year’s event takes place this Thursday, on September 13 in the main dining halls across campus, and is open to students and the public. 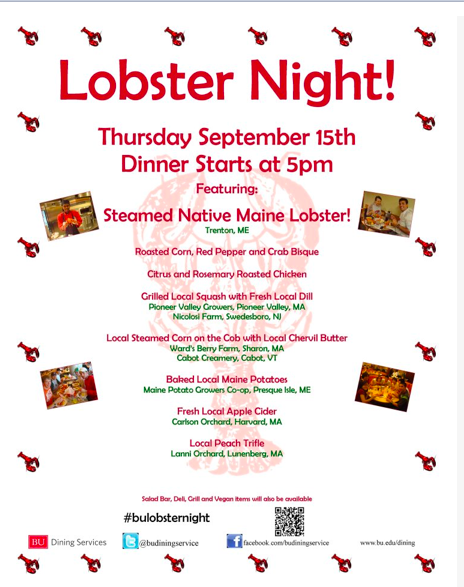 Lobster Night serves as both a community celebration of regional foodways and an academic indoctrination through food, teaching lessons that will aid students in the classroom and beyond. By sharing a locally sourced, celebratory meal together, students are transformed into a cohesive student body, grounded in the common culture of Boston University and the region of New England. Consuming lobster, an exotic other for many new students, and an iconic symbol of New England (Lewis 1998), is an intimate sensory experience that creates a lasting community memory that helps students to develop a spirit of exploration and openness. Touted as the “Event of the Year” for Boston University Dining Services (BU Dining), Lobster Night began in 1985 and has grown to now serve approximately 8,000 lobsters at dining halls across campus (Fichera 2011). When I attended Lobster Night 2011, the dining hall was a frenzied environment, filled to capacity with lines stretching out the door. 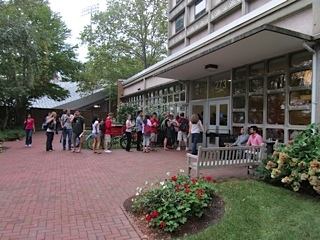 Once inside the dining hall, students attempted to form lines at several stations serving the lobster dinner; the lines oft converging into one dense crowd. By featuring locally sourced, regional cuisine, Lobster Night fosters “local patriotism” (Tuan 1974: 101, quoted in Bell 1997: 149) among the students in attendance, which manifests in knowledge of New England foodways, a connection to the culture of the region, and a commitment to Boston University. Serving locally sourced items also places each food within the context of a distinct farm, city, state, and region. This literal connection to New England’s soil and water bodies connects the eater to not only the food item, but also to the region and its food culture. For a student new to Boston University and the region, the consumption of local foods of regional significance aids in creating a new sense of home and belonging. Navigating the crowd grasping a plate piled high, students stake out places to sit like city drivers seeking available parking. Once seated, Lobster Night serves as both a rite of “conspicuous consumption” (Neustadt, 1992:151) and a “seasonal rite of passage” (145). While, at first glance, a jovial and messy dinner, Lobster Night is also a highly symbolic event. First, Lobster Night unifies both insiders and outsiders into a cohesive body. This unification process includes induction to not only eating lobster, but also to Boston University and New England. Second, through eating lobster, new students literally consume a symbol of New England, which makes them figurative citizens of a new region. In this case, consuming the exotic other, a lobster, is an intense sensory experience and a highly memorable undertaking. For students, and all diners for that matter, eating lobster for the first time can be an intimidating experience requiring new knowledge, including the use of unfamiliar tools, and a willingness to look and feel a bit silly wearing a bib and eating messily. While some food festivals specifically target and welcome insiders — those with expertise or passion for the festival’s main foods — Lobster Night enthusiastically welcomes outsiders, particularly those who may have never before eaten lobster. Eating a lobster is tactically intimate. While students experience the crab in the bisque from a distance, separated from the seafood by the eating utensil, the spoon, this is not the case with the lobster. Eating lobster requires an adventurous eater, open to new experiences, qualities that will also serve students well in their academic pursuits. The adventure begins by extracting meat from the shell, which requires firmly holding the lobster with one hand and pulling the lobster’s limbs from its body with the other hand. The eater then crushes, cracks, and literally imparts violence upon the crustacean, using the potent lobster cracker. This tactile experience also lends itself to play. At Lobster Night, several students held up their lobsters, making them talk to one another like dolls, and many squealed and giggled in surprise and delight when juice squirted into the air as they dismembered their lobsters. By participating in the overtly sensory experience of eating a lobster, students fully partake in a regional ritual and actually ingest a symbol of regional identity. In doing so, students become unified as a group and linked to the university, and the region, in a memorable way. In speeches and messages shared each fall, university leaders encourage students to be active and engaged citizens, to explore their city, and to be students of the world. Boston University also imparts this message for one evening through lobster, speaking to students through foodways, inviting them to feel at home within the Boston University family and in New England, and to lay down a solid foundation for their collective academic journey. Bell, David & Gill Valentine. (eds.). 1997. “Region” in Consuming Geographies: We Are Where We Eat. New York: Routledge: 145-162. Fichera, John. 2011. “Lobster Anyone?” BU Today, September 15. Accessed September 15, 2011. Johnston, Josée & Shyon Bauman. 2010. “The Culinary Other: Seeking Exoticism.” In Foodies: Democracy and Distinction in the Gourmet Foodscape. New York: Routledge. Lewis, George. 1998. 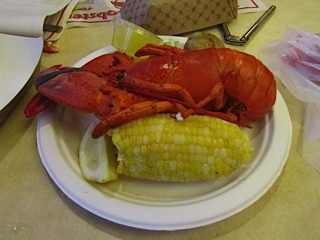 “The Maine Lobster as Regional Icon: Competing Images Over Time and Social Class.” In The Taste of American Place: A Reader on Regional and Ethnic Foods. Edited by Barbara Gimla Shortridge and James R. Shortridge. 65-84. Lanman: Rowman and Littlefield Publishers Inc.
Neustadt, Kathy, 1992. Clambake: A History and Celebration of an American Tradition. University of Massachusetts Press: Amherst.